Since this was a 3 day weekend, my plan was to spend as much time in the garden as possible. That is exactly what I did. I am now sitting here with my lap top, sore from head to toe but feeling incredibly accomplished. This is what I was able to get done...in case you care. *Plant heirloom tomatoes, peppers and green beans. *Plant herbs that didn't come up from seed in my herb garden. *Scoop and haul a 1/2 truckload of old hay. *Haul water to my garden. Yes this receives a bullet point as this is not an easy feat at the farm. I'm sure I am forgetting something as the list seems awfully short for all of the work that was done. Glad though that I can return to my 40 hour commitment tomorrow so I can relax! I came across this great idea from @mulberrymama, a gal I follow on twitter. She made an inexpensive garden fort for her children for around $10. I had to try it. I often bring my kids with me when I visit the farm. As I mentioned before, the land was severely neglected and my friends and property owners, have plenty on their hands without having to worry about the little corner of their property that I have taken over. Until they have a chance to level the acres of severely rutted land, the weeds will take over again as no mower, short of a tractor, will be able to manage the weed invasion. This will limit the safe areas that my children can play without running into the dreadful thistles. Mulberry Mama gave the the inspiration I needed to solve the little play area issue. There are some things that I needed to consider prior to building the structure. 1. I wanted it to produce some sort of food. Pole Green Beans were the obvious choice since the structure would be light weight and the beans wouldn't necessarily weigh it down...too much. 2. I needed the structure to accommodate approximately 10 feet as that is as long as the beans could become. 3. I needed it to be easy to assemble. 4. I needed the over all cost to be around $10. Things I wanted the structure to accomplish. 1. To be a wind barrier. It is windy out there on the farm! Wind burn is a short second to sun burn. 2. I wanted it to be a large enough area both of my kids could sit in and stay out of the sun. So with those things in mind, I headed out to the hardware store. I decided to purchase 4, 10 foot by 1/2 inch conduit pipe as it was only a $1.70 a pole. To be quite honest, I have no idea what the difference is between regular pvc and conduit pipe. All I knew is that it was flexible. I also purchased 1, 10 foot by 1/2 inch pvc pipe. The conduit pipe had a male and female end. In order for me to connect the pipes using a connector piece, the pipe needed to have male ends. Last were two, 3 opening 1/2 inch connector piece. All of that totalled less than $10. For the sides or what the plants would climb on, I brought along some left over chicken wire, and when that ran out, I used fishing line. This is the end result. Please keep in mind, I left my 11 year old son in charge of measuring. Not quite perfect but a learning experience none-the-less. As you can see it is defiantly not perfect. I figure it will add to the character of the structure as the plants grow. I used newspaper and left over wood chips as a weed preventative. I think my kids will love it. Thanks Mulberry mama for your idea. I will keep everyone posted on its success. I'm being optimistic so please send happy thoughts my way. Last spring, I planted two very small Thyme plants. How nice, I thought it would be to have fresh thyme to go into my countless recipes. Fresh homemade spaghetti sauce, roasted on vegetables, used on fresh meat. Oh boy was it. We enjoyed it throughout the summer and early fall...so did my friends and family. I didn't read up on this delight when I planted it so there were a couple things that I didn't know. 1. That it will come back the following year. Herb gardening, besides cilantro, was somewhat new to me. 2. That it would make a beautiful addition to a flower garden where you need ground cover. 3. Ground cover indeed! I had no idea how quickly these tiny leaves could spread. That is where I find myself today. Those two Thyme plants are trying to take over my herb section of my garden. They are about 2 feet in width and it isn't even the end of May! So I figured I better get on the ball and dry some for later use and defiantly give some away to other Thyme fans such as myself. 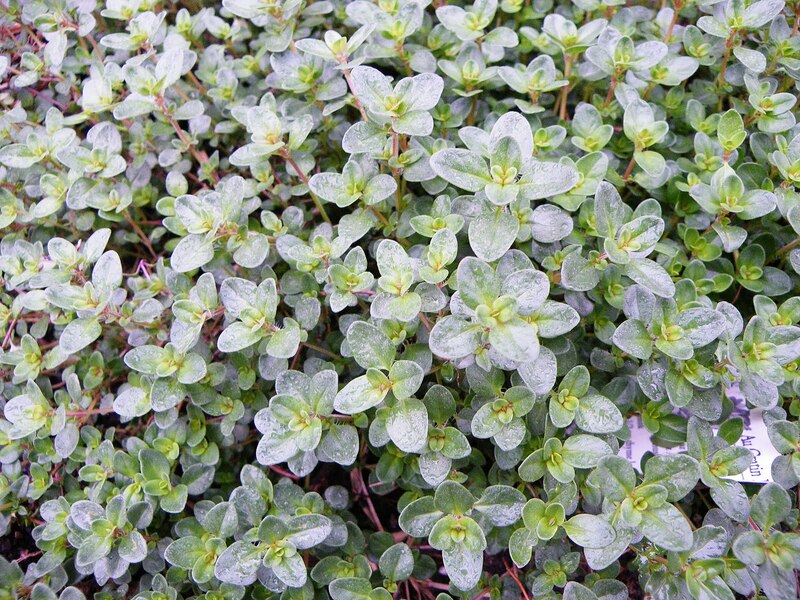 Did you know that if you wrap the thyme in a damp paper towel, you can store it in the fridge for up to a week? I wish the smell would resonate in my fridge, I think that would be wonderful. -The Romans used thyme in the treatment of depression. -In the Middle Ages, people placed it under their pillows to prevent nightmares and aid sleep. -Oberon, the king of the fairies in Shakespeare's A Midsummer Night's Dream, says, "I know a bank where the wild thyme blows," referring to the bed of thyme in which Titania, the fairy queen, sleeps. -Hymettus honey from Greece is made from bees who gather pollen from wild thyme on Mount Hymettus. -When the Greeks said that someone "smelled of thyme" it meant that the person was elegant, refined, and stylish. I wonder if that applies to my refrigerator? 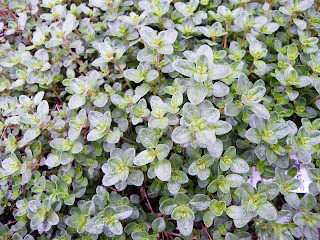 Off for now with an updated to do list that starts with thyme. In an attempt to beautify my property, I planted several, fairly low maintenance flowering vines and bushes a couple of years ago. I do not have the gift of being able to group plants that will complement each other or enhance a certain area. I just put individual rose bushes, clematis, lilies and columbine where I think they will look nice. 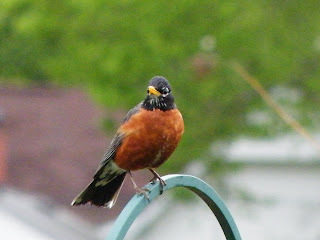 Some do, some don't, regardless, they add a little character to my yard. Next to the two toned is the deep purple delight. I have had this little guy for 8 years, even moved it from one house to the next. One of my favorites. This my friends is a beautiful flower provided by my tasty chives. I have my chives planted in my vegetable garden but as you can see, it can be a very nice addition to any landscaping. And this is one of the best treasures I found this morning. I haven't shown my daughter but I know she will love to devour it. This is just the beginning of the season so more treasures are certain to appear. For now, happy gardening. As I had mentioned in an earlier post, I have an enormous garden at The Farm. This little piece of heaven delights me and fills me with excitement to the possibilities it brings. However, a problem is quickly presenting itself, an issue that I didn't think long enough about, water. I have to admit, I was a little eager to pick my spot and may have chosen it too fast. In my mind, the area was perfect, no obstructions to block the valuable sunlight and plenty of untouched land. I didn't take into account how terribly windy the area was. Imagine if you will a beautiful, calm day...until you go to the farm. There, you are surrounded by hurricane force winds that will tie your hair into a million knots and position it into a tightly woven birds nest, right on top of your head. Ok so maybe it isn't that bad but needless to say, it dries the soil out very quick. So quick in fact that I believe I will need to be out there watering this summer, at least once a day. Last Sunday I had planted an incredible amount of seeds and plants. The soil was still moist from a previous rain and since I didn't bring water with me, I figured that they would be fine until I visited them again. Two days later, i paid these plants a visit only to find the soil already dry and cracked and my plants droopy. I felt so bad! Like I neglected these little guys. So I watered them with the water I had in a large jug in hopes to revive them a little. I knew I wouldn't be able to make it back out there until the next day so I prayed the small amount of water would be enough. The forecast didn't predict rain for several days so I knew, the next day I would need to find a way to gather more water and haul it out there. Thankfully, the forecast changed and rain we got. Beautiful, wonderful, soft, delightful, 24 hours of rain. Exactly what my garden, the seeds, the plants needed. I am eager to head back out to the farm to see if the plants regained their life. So here is my dilemma. What would be the most efficient, cost effective way to bring water to the site? The sheds and barns do not have gutters so collecting rain water may not be an option without some cost involved. I could bring a garbage can full of water out to the site but without the ability to drive the truck to the plot, I will need to haul the water one bucket at a time. Any suggestions, besides doing the rain dance, would be appreciated. Sometimes I get stuck in a cooking rut. I make the same things over and over again. To the point, certain favorites receive the try to cover up disappointment "Oh" when the "What's for dinner" question is asked. So in my efforts to expand my cooking horizons, I came across an asian based recipe that called for Bok Choy. I honestly had no idea what Bok Choy was, let alone cooked with it. So I opened up my favorite internet browser and read up on it. I found that it's a popular cabbage, sometimes referred to as white cabbage, used in Chinese and asian type recipes. The entire vegetable can be used from the leaves and the stocks. Sounded like I should give it a try and was extremely pleased to find that my local grocery store had a plentiful supply. The shape was not the standard round that I am used to. It almost resembled celery as it had tight stocks. The difference was, bok choy had big green leaves. I was intrigued. I made that recipe that night and fell in love with the crispy texture, the lightness, and the slightly sweet flavor. It was delicious and added an incredible crunchiness to our meal. I wanted more. I bought more. It went bad in my refrigerator. Not for lack of interest, I simply didn't get to it fast enough. Note to self, Bok choy doesn't last long in the fridge. Because of this, I had to find out if I could grow it in my region. What do you know, I could! In fact, it is a cold weather cabbage that does very well with the cooler, even pre last frost type weather. Out I went to hunt down seeds, which quite honestly were not too easy to find in my area. I persisted and finally found a packet. I planted in early April and they started to show themselves in a little over a week. Here is one today. Doesn't it look delicious? Bok Choy is low in calories and is loaded with vitamins. You will find it in soups, stir fry, salads, and appetizers, especially Asian based foods. I have a couple more weeks for these to reach maturity. They can be eaten while they are smaller, baby bok choy, I simply didn't catch them in time. After this first round, I will plant a second batch in the fall. I think we will enjoy the garden freshness and I for one will need to search for more tasty recipes. Goodnight for now and happy gardening. Have you ever tried fresh horseradish? I haven't...yet. I will soon as my awesome neighbor brought me a jar of it so fresh, the jar was still warm. I'm just waiting for the chance to try it out. I don't grow horseradish in my garden...that I know of. There are some clever weeds that are trying to pass themselves off as this awesome, nasal draining condiment but they are quickly mowed down, tilled up, or dug out. If I were to grow it, I would build its own special horseradish box to keep it from spreading. Horse radish is a persistant perenial that will continue to multiply it's masses. The main reason I wont grow it. That and unless I find a large group of bloody mary drinkers, I think most of it would go to waste. But for those of you who are or do want to grow it, the recipes sounds fairly simple. Dangerous but simple. In an electric food processor or blender, process horseradish root, vinegar, sugar and salt. Carefully remove the cover of the processor or blender, keeping your face away from the container. (Dangerous part, apparently it's hot) Cover and store the horseradish in the refrigerator. It can be stored up to 3 weeks in the fridge (bloody marys anyone?) or 6 months in the freezer. You will find all kinds of variations across the internet, with and without sugar, some with balsmic vinager and some with other fancy ingredients I would be lucky to find at my local supermarket. Well all this talk of Bloody Marys has given me a reason to try the horseradish. Good evening my friends. There have been many issues with soil, drainage, etc at my home plot. You see, the back of our property used to be a dumping grounds for trash, left over tools, etc. I have spent countless hours with a large magnet picking up old tools and random rusty metal pieces which surely would result in tetanus if stepped on. Occasionally something interesting would pop up like old glass marbles and or pottery. It's always a mystery what treasure I will find when tilling. Anyway, I have also done my best to remove or cover up all the gravel and rocks in the soil with compost and continuous removal. It is a never ending process and it still left drainage issues. Something occurred to me last year as my husband was reroofing our old 1940's garage. The old beams really were in pretty good shape and I knew that during the day and age that our garage was built, they wouldn't have treated it with harmful chemicals. I couldn't let that wood just go to the dump so I built boxes for my garden with it. Drainage problem fixed. Soil problem, fixed. Why didn't I think of this before?!?! So the boxes remained stationary throughout the winter. All but one that is. I removed that particular box because the soil still wasn't quite right and I wanted to have room to till in my compost again this year. The middle of April came around and the tilling was complete. The next day I decided to rebuild the box and place it in it summer home. In the mean time, I placed the box boards along my the side of my garage for easy access. 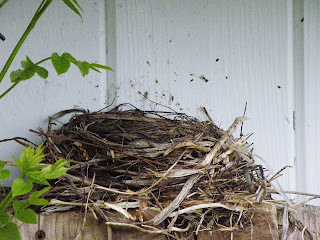 How in the world did a bird build a nest that quick RIGHT ON TOP OF MY BOARDS! Did this bird know I had plans for that wood the next day? 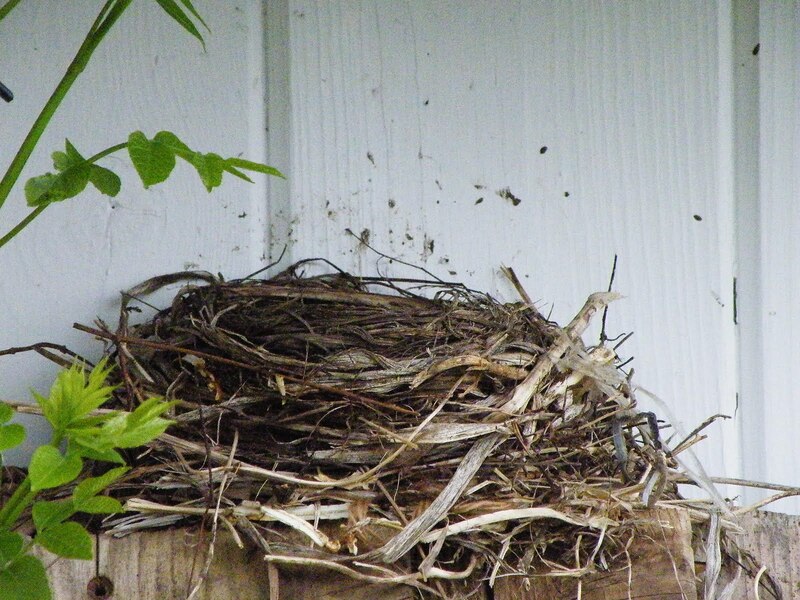 Well the Mama bird must have sensed my invasion of HER space and started feverishly chatting away at me. Here she is, mad as can be, keeping a watchful eye on me, making sure I'm not there to disturb her nest. For now, the box must wait. Mama bird lets me know it each time I make a visit to my garden. After my procrastination I finally ventured out to my garden to find perfectly happy sprouts. Whew! I was in the clear...so I thought. Saturday went on as planned, though the weather was very chilly. Knowing that my husband and I would be gone that evening, I continuously checked the weather for an ounce of hope that my sprouts would be safe once again. When we returned late that evening, I opted not to cover the plants. If they were safe the night before, surely they would be again. Nope, I was wrong. I should have listened to that little voice in the back of my head telling me to spend 2 minutes and cover the plants. Sunday morning I ventured out to find at least half of the seedlings at my home plot frost bitten. UGGG, I could have kicked myself. I didn't even want to visit the farm to see what happened there. The funny thing is, it seemed as if the frost was selective in its victims. Only 1/2 of my pole beans were struck, 1/2 of my starter tomato plants gone, lettuce OK, potatoes not so much. Anyway, I am hoping that some of them pop back, recover, resuscitate on their own. We are in store for 3-4 days of rain, so maybe, just maybe some of them will come back. As I mentioned before, it is still early so I will replant if necessary. But now I know to listen to that voice in the back of my head. Lesson learned. We had a beautiful April. Warm days, light rain storms, overall deceiving. Yes deceiving. Zone 4 gardeners know the planting season doesn't officially begin until about the first week of May. The soil is safely the recommended 60 degrees and the chances frost are slim. But this April, this warm beautiful April, made gardening very difficult to resist. So I planted, some, just to take the edge off. I simply couldn't take the nice warm weather and not get my hands dirty. Some of the things I planted are are cold weather resistant, bok choy, carrots, garlic and onions. I had a few garlic and onion plants, planted last fall but over the winter I decided I would need more so in they went. I also planted potatos, pole beans, zucchini, basil, rosemary, parsley (flat leaf), oregano, mint, green ice lettuce, cabbage, spinach, swiss chard, mesclun, grand rapids lettuce, pumpkins, summer squash, watermelon, muskmelon, and cucumber, all from seed. Yes, that is just some of what I COULD have planted. Things were going smooth, plants started to sprout, I was certain we were in the clear. But Mother Nature had other plans. Here I am, the first week of May, having to turn the furnace on. Yes, it was a wapping 50 degrees in my house this morning. My neighbors to the north are getting snow. Seriously...snow. This was supposed to be my planting weekend! Is this unseasonable? I don't know. The weather changes so often I almost believe this is normal, expected in a way. A friend of mine in zone 5 posted on his social networking page, "Thank goodness for global warming, otherwise I think we would be freezing!" I have yet to visit my garden this morning...i'm procrastinating. In the back of my mind I fear that the very cold, windy weather may have tested the happy existance of the delicate new sprouts. On the bright side, it is still early so if some of the plants didn't make it, I can always replant. This is my first entry, my first ever blog post. If you are reading this, thank you for visiting. I hope you find my adventures in gardening entertaining and maybe a little educational. I live in Zone 4 and for those of you who share my geographical location, know that we have unpredictable weather. One day it can be 80, the next 30 and snowing. Let's just say we never quite put away our winter clothes until about July and we keep our garden frost protectors handy. I started gardening years ago (10 years or so), recreationaly at first. I started with a tomato plant, peas, and a pepper plant. It never resulted in much but I was happy with what I received. Today, I have two large plots, one at my house for the veggies that need more tending to, and a second, even larger plot at a friends farm aprox 8 miles from my house. In the 10 years, I have learned to can and preserve my produce to last my family through the winter. I also give quite a bit away which warms my heart and the tummies of the receivers. Anyway, my friends and family have started asking me more and more about gardening which led me here. I figured I would keep a running log of what I have learned to help answer the questions that I receive. Well, if anything look back on my adventures and see how I progress over the years. Thanks for visiting my blog. I look forward to sharing my adventures.